Like finding the origin of Mother Goose in Bertrada of Laon, or finding the origin of "Ring Around the Rosie" in the Bubonic Plague, finding the origin of Halloween in the Middle Ages is difficult. 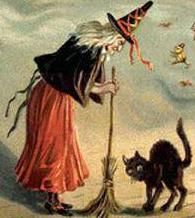 It is easy to associate ghosts and witches with an era that was technologically and academically more primitive. But the chain of causality requires more links than that ... so let's manufacture some. "Non enim pro locis res, sed pro bonis rebus loca amanda sunt." — "Things are not to be loved for the sake of a place, but places are to be loved for the sake of their good things." In other words, if the natives worshiped a rock or a tree or a hill, do not tell them that they are wrong. Instead, preach at that place and convince them that the special quality of the place originates with God, not in the tree or rock itself. Therefore, Celtic festivals weren't suppressed, but subsumed. The festival of Samhain (pronounced like sow in), approximately halfway between the autumnal equinox and the winter solstice, celebrated harvest time and the end of the growing season. It is, we believe (because the Celts didn't exactly leave written records), a time when dying was on people's minds because of what was happening to the flora all around, and so it was thought that spirits might be more likely to appear or be active around that time. In 609, All Saints Day was established in May, but in 835 it was moved to its current spot in November, right at the time that Samhain was being celebrated. Another name for All Saints was "All Hallows" because "Hallow" means "Holy" and refers to the saints. The evening before the day was therefore called "All Hallows Eve," which eventually was shortened to Halloween (the word "Halloween" doesn't appear in English until the 18th century). A three-day span of celebrating the dead was established in the 10th century when the 2nd of November was named "All Souls Day" to include a time to pray for those who were not saints. The pagan custom of leaving offerings (soul cakes) out for spirits is connected in people's minds with the candy and treats given out to children on Halloween. Pumpkins were not known in Europe in the Middle Ages, so we are told that jack-o-lanterns (the name first appears in 1660) were carved from turnips (the modern practice of carving pumpkins in America is first mentioned in 1834). Despite the similarities we can find between the ancient customs and the current pastime, to say that the former evolved into the latter would require putting aside any pretense at scholarly thought. Even a century ago, it was not being celebrated as it is today. The current secular holiday seems to be a revival of old customs for the sake of having fun, not an extension of a spiritual belief. 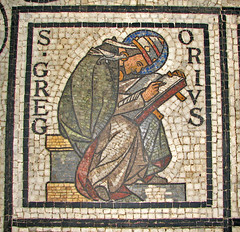 But it was an easy intro to Gregory the Great, who probably deserved a mention in this blog long before this. To round out the Merovingian/Carolingian week we've been having, let's take a look at some of the other women and children whose lives were intertwined with political events. Bertrada of Laon is interesting because she was so involved in the events of her time. * Many folk, however, were more ... "incidental" to their era. History focuses on the principals, and yet everyone had family around them. What about those other people? For instance: yesterday I mentioned that Carloman's wife wanted his son to inherit the throne after Carloman's death. What happened to her and her son? Her name was Gerberga, and little about her is known except that she must have been Frankish. When her brother-in-law Charlemagne married Desiderata, a Lombard (from the folk who were traditionally enemies of the papacy), Pope Stephen III wrote a letter to both brothers, referring to their father's "explicit order" that they be "united in marriage to beautiful Frankish women." There was no criticism about Gerberga as there was about Desiderata, so we can assume Gerberga was a Frank. Gerberga fled to Lombardy when her eldest son, Pippin, was rejected as king; this action seems to have motivated Charlemagne to enter Italy and attack the Lombards, finally defeating them completely and enabling him to give his eldest son, Carloman, the Iron Crown of Lombardy (and renaming him "Pippin" at the same time). But wasn't Charlemagne allied with the Lombards' King Desiderius through his marriage to Desiderius' daughter? Not anymore. I glossed over some facts in this post. Just as Pepin the Short put aside Leutberga to marry Bertrada, Charlemagne dumped Desiderata. His second wife was Hildegard of Vinzgouw, who bore several children; Carloman/Pippin was her child, as was Louis the Pious who inherited after Charlemagne. But what about Himiltrude? Probably not a wife, but a paramour whose son by Charlemagne, Pippin the Hunchback, was exiled to a monastery by his father years later after leading a rebellion. And then there was Fastrada, Charlemagne's third wife, whose daughter Theodrada (b.784) became an abbess. Charlemagne took a fourth wife, Luitgard, who died 4 June 800, months before he was crowned Holy Roman Emperor. They had no children. Ultimately, Charlemagne had 17 recorded children with between eight and ten wives and mistresses. He did his best by them, according to his biographers. Sons and daughters were all educated. When he was home, he took meals with his children. When he traveled, his sons rode with him. And I want to give some attention to Gisela. Pepin the Short and Bertrada had eight children that we know of, only three of which lived to adulthood. Charles and Carloman you know. Gisela (757-810) was dedicated to religion from childhood (according to Charlemagne's most famous biographer, Einhard), and became a nun at Chelles Abbey. Abbeys and monasteries were often the place where people could be put "out of the way"—under house arrest, as it were, such as with Pippin the Hunchback mentioned above—but that was not the case with Gisela. For one thing, as a woman she posed no threat to her brothers' ambitions. Also, Chelles Abbey appears to have benefited from her presence. Charlemagne's interest in education and the arts is well-known, and Chelles became a tool of the Carolingian Renascence. Chelles became a prolific scriptorium in the 8th and 9th centuries, copying and preserving manuscripts from all over. Gisela would have had welcome company later, when Charlemagne's daughter Rotrude joined her aunt there. Gisela probably joined the abbey too late to meet her step-grandmother: Charles Martel had also had more than one wife, and his second, Swanachild, was put in Chelles after Charles' death, when she failed in her attempt to help her son Grifo claim some inheritance from his half-brothers, Pepin the Short and Carloman. I am always curious about the bystanders, the people involved in fascinating times but whose personal stories we can never know. I'm glad for the chance to give some exposure, however brief and incomplete, to the unknown facets of stories we have all heard before and think we know. *And, of course, few other women in the Middle Ages were played on Broadway by Irene Ryan. Nota bene: the musical "Pippin" is based on the life of Pippin the Hunchback, not Carloman/Pippin who became King of Lombardy. Bertrada of Laon, first introduced here, was the wife of Pepin the Short and mother of Charles (later Charlemagne) and Carloman. * She was not a passive wife and queen. Her relationship with Pepin started while he was still married. She accompanied him on military campaigns. After his death, she stayed involved in the kingdom through her sons. Her sons did not always see eye-to-eye. Each had half their father's kingdom, but they were supposed to share the part of Aquitaine that Pepin had conquered. When Pepin's death motivated the Aquitainians to rebel, Charlemagne led an army to subdue it. Carloman likewise marched in with an army; the two joined up at Moncontour, where the brothers quarreled and Carloman took his army and went home. Some historians think Carloman was hoping to see Charlemagne's power appear unequal to the task of ruling. Charlemagne succeeded in putting down the rebellion, however, and Carloman simply looked petty and unpatriotic. Although Bertrada was living at Aachen with Charlemagne—and would for most of her widowhood—she is credited with trying to reconcile the two after their falling out. In light of later events, however, I wonder at her motivations. Her efforts in supporting Charlemagne often seemed to be to the detriment of her younger son. For instance, she persuaded Charlemagne to marry Desiderata, daughter of King Desiderius of Lombardy. The Franks had fought the Lombards on the pope's behalf in the past, so this was an unusual move. The result, however, was an alliance between Charlemagne and an enemy who would no longer give him trouble. Apparently Carloman tried to warn the pope of the dangers of this alliance, but Bertrada had convinced Desiderius to give up some territories that were of interest to the papacy. The pope was persuaded to bless the union of his friend with his enemy. In 770 Bertrada visited Carloman at his headquarters in Seltz (a little northwest of Baden-Baden). It was a unique visit for her, and we don't know what her purpose was: maybe to soothe his hurt feelings, maybe to explain to him her vision for the kingdom, which seemed to be centered on Charlemagne. She also traveled to Bavaria in 770, to speak to Duke Tassilo. Tassilo was a nephew of Pepin the Short, and Bertrada was probably relying on the alliance between the Bavarians and Lombards to ensure the support of the Lombards for Charlemagne. Not only did this marriage create an alliance between Charlemagne and the enemies of the pope, but also meant Carloman's territory had Charlemagne on his western side and a traditional enemy in the Lombards on the eastern. Carloman was isolated now, but his discomfort would not last long. Carloman died suddenly in 771; very suddenly, but no chroniclers at the time hint at foul play (of course, the chroniclers at the time were fans of Charlemagne). His widow expected their son Pepin to inherit, but her husband's advisers all turned against this plan and asked Charlemagne to reunite the kingdoms. It was only after Carloman's death and Charlemagne's assumption of power over the whole kingdom that Bertrada left her son's side and retired to the Abbey of Choisy sur Aisne. She died in 783; Charlemagne buried her with honors in St.-Denis. One final note. Bertrada had a nickname: Regina pede aucae (queen with a goose foot). In English, she was called Bertha Broadfoot. No doubt she had large feet, and perhaps walked a little oddly. Some (pseudo-)historians have decided to make a connection between her and the character of "Mother Goose." The earliest reference we have to such a figure is from 1650 and a reference in French to something "like a mother goose story." As I explained in the case of the rhyme "Ring around the rosy" however, such tenuous connections ought never to be made. Okay, one more final note on the relationship between Charles and Carloman: Charles named his eldest son "Carloman" as, we would assume, a tribute to his brother. This boy was named King of Italy and took the Iron Crown of Lombardy in 781, but there is no King Carloman of Italy in the records. Why? Because in that same ceremony, Charlemagne re-named his son "Pippin," wiping out the tribute to his now-long-dead brother. Ouch. *There was a third child who lived to adulthood, Gisela (757-810), who became a nun and then abbess at Chelles Abbey. 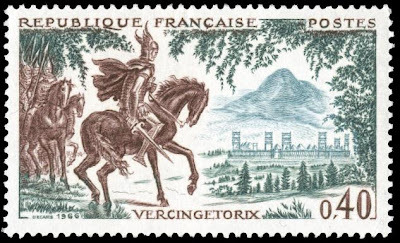 Properly speaking, the Carolingian Era started with Carolus Martellus, Charles "the Hammer" Martel (c.688-741). After his death, his two sons maintained order in the Frankish kingdoms of Neustria and Austrasia, until Carloman stepped down in 747, leaving Pepin the Short to unite the two and be named Rex Francorum (King of the Franks) by the pope. Sadly, for the kingdom, it was divided again upon Pepin's death, between his two sons, Charles and Carloman. There appears to have been bad blood between the brothers, but little agreement as to the cause. Consider, however, that the two were very young when their father—and both boys, to ensure the dynasty's legitimacy—was anointed by Pope Stephen II. They had both grown up believing it was their destiny to rule. Also, they had never known a divided kingdom. 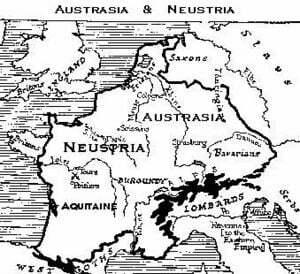 Their father had united the two parts, and then extended the borders into Aquitaine. In 768, after the kingdom of the Franks had been unified for 20 years, to have it made smaller again by dividing it might have tried the patience of the most peaceable of brothers. Perhaps a mother's influence might have softened the sibling rivalry, except that this mother had a favorite. Bertrada of Laon married Pepin in 740—and here is another potential reason for the brothers' hostility. "Married" might not be considered a flexible term in this case. (Remember that it would take the church another 500 years to codify marriage a little more strictly.) Pepin was apparently married earlier to a Leutberga, of whom little is known—still married, technically. He put his first wife aside in order to choose Bertrada. Charles was born in 742 from this second union. Pepin and Bertrada's marriage was not confirmed by the church until years later. After the marriage was considered legitimate, Carloman was born. Carloman may have considered himself the legitimate heir, even though Charles was the elder. Bertrada was an educated woman and spoke Latin. When Pepin went to Narbonne to fight Saracens, she accompanied him. This desire to be involved in politics meant she wasn't going to sit idly by while her sons ruled their respective parts of the kingdom. We'll see a little more of that tomorrow. Pepin (714-768) was not the only son of Charles Martel to take a leadership role; he's just the one we remember because of his son, Charlemagne. But the Carolingian Age started with Martel, and Pepin was an important part of it before Charlemagne stepped onto the scene. Pepin had two brothers. After the death of their father, Carloman (the eldest) was Mayor of the Palace for Austrasia (including Tournai, Aachen, Cologne and Metz) while Pepin was Mayor of the Palace for Neustria (the territory from Nantes and Tours on the south along the Loire to Soissons in the north). They picked Childeric III to be a puppet king starting in 743, not being willing to take over in their own right. * A third brother, Grifo (son of Charles' second wife), wanted to have some authority, but Pepin and Carloman locked him away in a monastery. In 747, Carloman decided to retire to a monastery, leaving the running of Austrasia to Pepin. Pepin decided it was time to make a radical change, so he wrote to Pope Zachary with a question: who should be king, the one with the family title or the one who actually exercised the power? By this time, the pope had come to rely on Frankish military support, so he was certainly willing to take the necessary steps. He dethroned Childeric and tonsured him. (The cutting of his hair was a powerful symbol: the Merovingian line believed in not ever cutting their hair as a sign of the royal authority.) Childeric and his son, Theuderic, went to a monastery. So Pepin the Short (infrequently called Pepin III because his grandfather and great-great-grandfather were both Pepins) became the new King of the Franks, being anointed by the archbishop of Mainz in 752, and then in 754 at St.-Denis in Paris by Pope Stephen II. In order to ensure a succession, the pope anointed Pepin's sons at the same time, establishing that the two boys, Charles and Carloman. Pepin's first act was to attack the Lombards in Italy, returning control of Ravenna and more to the pope, establishing the Papal States and the pope's temporal authority. He also worked hard to assume control over as much the the Aquitaine as possible. He continued to expand the army and cavalry as his father had done. He fought more battles with Muslims encroaching from Spain and drove them out of Gaul. He was, in fact, never defeated in battle. Which is not to say that he never died in battle. He died at the age of 54 in a military campaign. He was interred in the church of St.-Denis. Just as the kingdom was divided among Clovis' four sons, so was it divided again between Pepin's sons Charles and Carloman. The Carolingians had the potential to be just as divisive as the Merovingians who came before. Sibling rivalry can be even more bitter, however, when mother plays favorites. *Childeric was truly plucked from obscurity; modern historians are not sure of his parentage. Kings cannot run every administrative detail of their household themselves, so they appoint people to do it for them. Chamberlain, seneschal, castellan, steward, concierge, major domo—these are all terms to describe the person fulfilling that role. The Frankish kings of the 7th and 8th centuries referred to their major domo (Latin for "superior of the house") as the "Mayor of the Palace." In the case of the Franks, the Mayor of the Palace was a hereditary position, descended from an invaluable Merovingian advisor, Arnulf of Metz. His son married the daughter of Pepin of Landen, and from them came a line of Mayors of the Palace who would ultimately change the Frankish world. In yesterday's post on le rois fainéants, I mentioned that, after Theuderic's death in 737, the throne remained vacant for seven years. Clearly, the country did not disintegrate, and so someone must have maintained its proper functioning. That someone was the Mayor of the Palace, Charles, called "Martel," "the Hammer." He was called "the Hammer" because of his brilliant military victories, especially at the Battle of Tours in 732. Details of the battle—its location, the numbers on both sides—cannot be determined with the scant records available to us, but what is known is that he halted the progress of Islam into Western Europe and in the process cemented Frankish authority over the southern part of Gaul/France. He is also credited as a champion of Christianity. In 739, two years after Theuderic's death, Pope Gregory III offered Charles the office of Consul in Rome: one of the two highest elected offices. Charles declined. Of course, at that time he was the de facto ruler of most of what we now call France; why give that up? He had been calling himself princeps et dux Francorum (prince and duke of the Franks), and was apparently not interested in the title of "king." But let us be clear: this apparent modesty does not mean he was a "nice" man. Charles kept Theuderic in custody during the last years of his life, first at an abbey, and later at a castle in a town called Otmus. * Charles was not about to let Theuderic's incompetence threaten the stability of the nation. We hardly hear about Charles Martel today, even though his name was given to an age: the Carolingian Age. When he died, his son, Pepin the Short, asked Pope Stephen II "Who should be king? He who has the title, or he who wields the power?" By that time, the pope depended on Frankish armies for many purposes; he crowned Pepin "King of the Franks." It was Pepin's son, however, the grandson of Charles the Hammer, who would truly unite that part of the world and take it to administrative, academic, and cultural heights not imagined since the glory of Rome: Charles the Great, known everywhere today as Charlemagne. *During his captivity, the town took on the name Castrum Theodorici ("Camp/Castle of Theuderic"). The name stuck, and now en Français is called Château-Thierry. What do you do when a dynasty seems to become useless? You name them Le Rois fainéants (The do-nothing Kings). The Merovingians are the descendants of Merovech or Merovius, a semi-legendary figure whose father was—according to various reports, such as the Chronicle of Fredegar, expanding on something said by Gregory of Tours—a sea deity. Whatever the case, his son Childeric I (c.457-481) was known to be leader of the Salian Franks, and his son Clovis I united all of Gaul. The Salian Franks came to an agreement with the Roman Empire. The Salians settled in what had been Roman territory at one time, built a decent political alliance with Rome, and slowly adopted some Roman culture, shifting from the reputation of the Germanic tribes as uncouth and warlike. When Attila and his Huns became a problem for Rome, the emperor was able to call on the Salian Franks—by now well-established as the Merovingian dynasty—for aid, ending the threat to Europe from the Huns. The adoption of Christianity was another trend that helped change the composition of Frankish culture in Gaul. Although Goths and others adopted the heretical Arianism, the baptism of Clovis cemented ties between the Frankish kingdom and Roman Catholicism, giving them the support of the Pope as well as the Emperor. Clovis' thirty-year rule may have been the high point of the dynasty, however. The Salic Law confirmed royal inheritance exclusively to male descendants, but not limited to the eldest. Clovis' kingdom was divided among his four sons upon his death. Sibling rivalry often turned into civil war among Clovis' descendants. Even worse: over the next two centuries, these frequent struggles between adjacent sub-kingdoms and the desire to reunite them under one banner had an unintended consequence. Young heirs sometimes became tools of strong military leaders who wanted to cement some power for themselves but needed a divinely anointed king under which to do it. By the 7th century, with much of Frankish land brought together again, the Merovingian line became a series of weak kings who seemed disinterested or simply unable to take control and do anything notable. 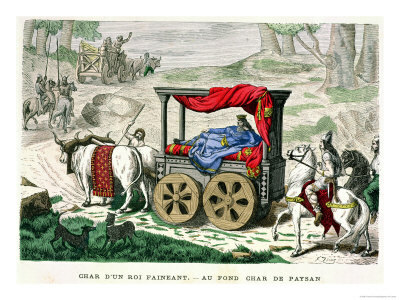 From 675 (Clovis III, king of Austrasia for one year) to the death of Theuderic IV in 737 (after which the throne was empty for seven years), there were a half-dozen kings of the Franks who are called le rois fainéants because of their uselessness and complete lack of administrative agenda or ability. It was a sad ending to what might have been a noteworthy dynasty in that part of the world. So...what if you were a competent administrator working in the palace, seeing the problems and wishing you could help get the kingdom back on track? Well, if you are a top administrator with the nickname "Charles the Hammer," you take things into your own hands—for the good of the kingdom, of course. That's a good story for tomorrow. Georgius Florentius (539-593) was born into a distinguished Gallo-Roman family in Arverni in southern France. His father died when he was young, and Georgius went to live with his uncle, Bishop Gal, who educated him as a cleric. After recovering from a serious illness, he decided to join the church, and he changed his name to Gregory in honor of his mother's great-grandfather, the Bishop of Langres. As brave as he was in trying to ameliorate the crude Frankish culture with an infusion of more sophisticated Roman culture and Christian sensibility, he was also diligent in recording the history of his country. He wrote ten books of history (Historia Francorum, History of the Franks), seven on miracles, one on the lives of the early church fathers; he also wrote on liturgy and scripture. His work can be called propagandist—or perhaps simply written unsurprisingly with his own personal filters—since Christian tribes and countries always come out looking better than pagans in his history. He also comes out strongly against Arianism and Jews. Despite his moralizing—maybe because of it—his anecdotes are an excellent view into the culture and customs of the time. His history, along with two other works called the "Chronicle of Fredegar" and the "Book of the History of the Franks," provide an almost unbroken history of Gaul for 300 years after the Fall of Rome. He is also fairly objective at times: his writing on miracles questions the truth of some of them. He is also our best source of history for the Frankish dynasty called the Merovingians while it was still strong and founding what would eventually become the nation of France. He would have been saddened a hundred years later to find a line of kings so different from Clovis and Chilperic that they would be called the "do-nothing kings." But that's a tale for another day ... like tomorrow. *Diocletian (245-313) was the emperor responsible for the final and worst wave of Christian persecution in the Roman empire. The announcement for the First Crusade was made from Clermont in France. The name "Clermont" came from the Latin clarus mons (clear/plain + mountain), originally the name of a castle because of the dormant volcano next door, and later the name of the city it overlooked. But that wasn't until the 9th century. It had a much earlier name in the 2nd century, Arvernis, because it was the capital of the Gallic tribe the Arverni, whose leader Vercingetorix united several Gallic tribes under one banner to fight Julius Caesar. The name "Arverni" lives on in the modern French name of the region, the Auvergne. As one of the oldest established cities in France, it has a long and noble history. In the 5th century it had a large enough Christian population that it earned its own cathedral and bishop. It fought against Visigothic expansion numerous times, until in the late 5th century the Roman emperor gave up on it and let the Visigoths have it. Eventually it fell under Frankish rule. The First Council was hosted by the bishop of Arverni, Bishop Gal I. Later, he would be canonized as St. Gal, not to be confused with St. Gall of monastic architecture fame. Although Gal I defended the church steadfastly, and was known at the time for his amazingly even-tempered approach to conflict and personal injury (when struck on the head, his calm response completely disarmed the attacker and defused the situation), he is not well known these days. Connected with him, however, is a true "local boy makes good" story. I am referring to Gal's nephew and pupil, Gregory of Tours, who was not named Gregory and did not come from Tours. But that's a story for tomorrow. Among the accomplishments of Hermann of Reichenau, he also provides us with the set of rules for one of Europe's oldest board games, developed by a monk to teach Boethian number theory, called Rithmomachy or Arithmomachia, "Battle of the Numbers." The pieces on the rectangular 8x16 board, their "ranks" and their allowed moves are determined by mathematical rules based on their geometry (Circles, Squares, Triangles, Pyramids) and the numbers marked on their surfaces. I could not possibly explain the rules in a short post—nor should I be able to, since the intent was to design a game that truly requires a grasp of mathematical functions and the skill to apply them quickly. Feel free to educate yourselves on the rules here and here. The game became popular as a teaching aid in monasteries in France and Germany, and even reached England where Roger Bacon recommended it to students at Oxford. Over the centuries it spread as an intellectual pastime, and by the Renaissance it had spread enough that instructions were being printed in French, German, Italian and Latin. Sadly (mercifully? ), the game fell out of popularity and the public's consciousness after the 1600s until modern historians re-discovered it. I have mentioned St.-Denis in Paris as the first church in the Gothic style. That project was a re-building of an earlier church—a church, in fact, that would be notable to historians even if it had not been turned into an architectural wonder by Abbot Suger. Originally, the structure was a martyrium—a shrine to the martyr Saint Denis, whose head had been carried to that spot (by his decapitated body) while preaching a sermon. This would have been some time in the 3rd century. Dagobert, a King of the Franks (c.603-639), built an abbey on the spot, preserving the crypts that had been installed over the centuries to house kings of France and important figures. The first mention of a church is of one begun in the reign of Pepin the Short (c.714-768), whose son, Charlemagne, finished it. Then, of course, Abbot Suger in the 12th century re-worked much of it into what stands today. All of the building and re-building went upwards, and what was below the surface was untouched for centuries, until later scholars decided to examine the crypts. Some of the crypts are not marked well. Knowing a list of interments, however, scholars could use a process of elimination along with various dating techniques and even DNA testing to determine the identity of the subjects. There's also direct evidence. An archaeologist and art historian in 1959, examining the contents of one unlabeled sarcophagus, struck gold. Along with the remarkably well-preserved clothing on a female body, he found a gold ring inscribed to Aregund. To be frank,* there are some who believe the remains belong to another noblewoman who lived decades later. Most of the reasoning is based on the age of the sarcophagus. The arguments neglect the simple possibility that Aregund was re-interred—not an uncommon occurrence. Even if the identity were up for debate, however, the value of the contents as a glimpse into 7th century Frankish culture is incalculable. In November 1095, Pope Urban II had an announcement made at Clermont in France. The event had been advertised well ahead of time, so that thousands had time to make the journey to hear of the great enterprise he proposed. As the pope's speeches were given and repeated, excitement rippled out across the faithful. His call to action was astounding: for an army of volunteers to travel to the sacred city of Jerusalem and free it from Muslim rule. To be thorough: there was more to the plan. Emperor Alexios I of Byzantium had requested help from the pope against invading Turks, and the pope saw an opportunity to help his Christian brother and then, since a western European army would be so close (800-900 miles! ), why not take back the city that had been occupied by non-Christians since the 7th century? Expeditions like this required careful planning, and so the pope intended that it should begin in August of 1096. Other crusading groups (there were five major groups prior to the official and organized army) traveled down the Rhine and, finding communities of Jews, took it upon themselves to slaughter them or force them to convert to Christianity. Estimates of casualties among Jews range from 2,000 to 12,000. The largest group was led by a priest from Amiens, Peter the Hermit (d.1115), who preached the Crusade in France. He rode a donkey and claimed to have a divine commission to lead. He arrived at Constantinople with 30,000 followers, putting Emperor Alexius I in the position of needing to provision this "army" (which included women and children). Walter's group and others showed up as well. Constantinople could not play host to so many needy tourists, and Alexios agreed to ship them across the Bosphorus to Turkey, telling them to wait while h arranged soldiers to get them through the Turkish territory. Crusading fever would not allow delay, however, and the largely non-military masses advanced, to be cut down in the thousands by the Turks. Wounded, starving, and penniless, the handful of survivors could only wait with Peter (Walter had been killed by several arrows at once) for the real army to arrive. Jerusalem was captured by the armies of the First Crusade, but none of the success can be attributed to any of the tens of thousands of people who set out months early with little but faith on their side. *I think of Dan Ackroyd and John Belushi in the movie "The Blues Brothers": "They can't stop us: we're on a mission from God!" When Henry I (1068-1135) was king of England, the rule of the law was simple: someone had to pay for a crime. The philosophy was "who sins unwittingly shall knowingly make amends." This was a few decades into Norman rule in England, but it mirrored the previous Anglo-Saxon law as well: someone had to be responsible if a wrong had been committed. In fact, the law under King Cnut (985-1035) demanded that even an infant who broke a cup was guilty as if he were an adult acting deliberately. (Remember the importance of the wergild to pre-Norman England.) At least Henry's law allowed the very young and the insane to be considered innocent, being not in their right minds. Accidental injury was still injury, however, until a legal expert came forward who tried to change that. Henry Bracton (1210-1268) was a jurist who worked hard to codify and update English law, using the well-developed Roman legal system as his guide. His four-volume De Legibus et Consuetudinibus Angliæ (On the Laws and Customs of England) informed much of English law afterward, even though he didn't finish it (I'll explain why shortly). He had a lot to say about the practice of seeking Sanctuary in a church, about "writs of appeal," and murder fines and dying intestate. But what we are looking at today is the concept of mens rea. This was a significant change, and made a harsh law more reasonable. The fact that a felony in modern jurisprudence requires intent starts with Bracton's move away from a strictly "mathematical," eye-for-an-eye approach to punishment. So why didn't he finish it? Bracton rose far in his career: from being a justice at the age of 35 to being a member of what became the King's Court. But by 1257, something prompted him to quit his position not long before the summoning of the Mad Parliament by Henry III and the unrest that led to the Provisions of Oxford. By quitting, he had to turn in all of his papers, court cases, notes and copies of the law that he had been drawing on to write De Legibus. The timing is suspicious, especially considering the personal cost to him and his life's work. One wonders if he wanted to avoid taking sides, or, if he already had taken a side, who he was afraid of angering most: the king or the Barons. Whatever the case, he walked away from law and courts for years, becoming a rector in a couple places, then an archdeacon, and finally the chancellor of Exeter Cathedral, in the nave of which he is buried. But in the last year of his life he was drawn into one more court case which, depending upon his reasons for leaving the law just before the second great conflict between a king of England and the Barons, might have been awkward for him. At the end of yesterday's post, the Dictum of Kenilworth was mentioned, allowing the rebels to make a case to reclaim their estates from their king. Henry Bracton was appointed to the committee that heard their cases and decided the outcome, giving him one last chance to practice law—on behalf of people who had been his colleagues on the King's Court. Henry III (1207-1272) spent much of his reign of 56 years dealing with fallout from the reign of his father, King John. For one thing, the Barons who pushed the Magna Carta on John were always looking for ways to increase their power. In 1258, they got their chance. Henry had fought a military action against Sicily on behalf of Pope Alexander IV, and subsequently was out of money. So he summoned Parliament in the spring of 1258 to discuss a grant of revenue. The Barons agreed, with the provision that Henry would, in exchange, submit to a list of reforms. This Parliament is alternately called the Easter Parliament and the Mad Parliament. Henry (reluctantly) agreed, and on June 10th the 24-man commission created to develop the reforms (half appointed by the king and half by the Barons) submitted its report. 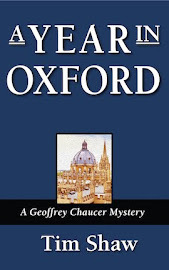 The changes within were called the Provisions of Oxford. Although considered by some to be the first written constitution in England (and the first published in English: copies were circulated to all of England in French, Latin, and Middle English), the Provisions were actually very short-lived, being superseded by the Provisions of Westminster in 1259. (In fact, they were only supposed to exist for 12 years, as a temporary measure while further reforms were being studied and put in place.) As a consequence, we are not sure that we have a complete record of the Provisions, relying instead on references to them found in contemporary and later documents. Still, we know enough to know that they attempted a series of regulations and "checks and balances" in government. For instance, Parliament was to meet three times a year, not just when the King wanted them. All high officers were to swear loyalty to the king. Many positions (such as the chancellor, the chief justice, the treasurer) were appointments of only one year—helping to prevent the amassing of power and the temptation to long-term corruption—at the end of which the officer was to give an accounting of his actions while in office. A system was put in place for addressing grievances against sheriffs. Sheriffs were to be loyal landholders who would receive no fees for their work, but be subsidized by the exchequer for their expenses. Attempt to curtail royal power persisted, and the conflict see-sawed. Pope Urban IV annulled the Provisions in 1261 and 1262. The Barons restored and reinforced them in 1263, then modified them in 1264. Finally, the Barons took over England in 1264, Henry defeated them at the Battle of Evesham in 1265 and killed their leader, Simon de Montfort; some Barons held out at Kenilworth, and the siege that started by Henry was curtailed by the intervention of the pope, who suggested reconciliation. 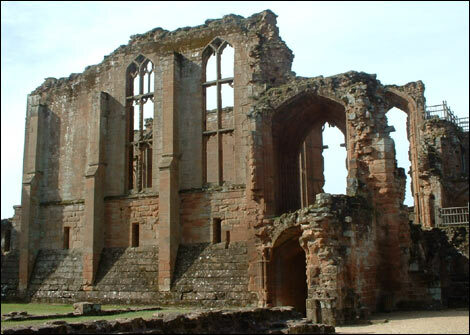 The resulting Dictum of Kenilworth allowed the rebels to have their estates back (at prices dependent on how rebellious they had been! ), and many of the statutes in the earlier Provisions were overturned. Henry agreed to reconfirm Magna Carta, but the appointment of royal officers was re-recognized as a royal prerogative. The reconciliation between the levels of power lasted through Henry's reign and into that of his son, Edward I (1239-1307). Tornadoes usually form when masses of warm, moist air and higher altitude cooler air meet. The cooler air descends, the warm air ascends, and the action creates a vertical funnel of swiftly rotating air. The majority of tornadoes in the world are created in the North American mid-west, when cool air coming over the Rocky Mountains meets the warm air rising from the Great Plains. With these geographical features, North America has what is called "Tornado Alley." Without these geographical features, tornadoes have a more difficult time forming; when they do, they are usually very weak. In fact, in the 1000 years prior to the 20th century, only about 2 dozen tornadoes were recorded in all of Europe. Which makes it all the more interesting to learn that a tornado—the earliest known in England and perhaps the biggest ever experienced by that country—hit London in 1091. Once again, London Bridge fell down. The church of St. Mary le Bow was flattened, and four of its 26-foot-long rafters were driven into the ground with such force that only 4 feet remained showing. Several other churches were damaged or destroyed, as well as 600 houses. Estimates of the force of the tornado seem foolish, but people have tried, and they rate it an F4 on the Fujita Scale (F0-F5), with winds at 200 miles per hour or more. If that is true, then it is truly remarkable that there were only two deaths reported. A tornado like that hitting London now would be striking a city of more than 8 million, but in 1091 estimates for London's population range from as few as 10,000 to as many as 20,000. In October of 1091, actually, there were even fewer people in London than usual. Thanks to the Anglo-Saxon Chronicle, we know that King William II was up north with his retinue and army fighting King Malcolm Canmore of Scotland (1038-1093). William prevailed, and was out of town when disaster struck. All things considered, it was probably the luckiest military campaign he ever undertook. In April 2013, near Meßkirch in southern Germany, construction will start on a monastery. It is expected to take 40 years to complete, because the builders will use 9th century tools to build it. This alone should be sufficient to ensure its celebrity on the Internet and in the hearts of medievalists. But wait ... there's more. The design of the monastery complex is from a document that is 1200 years old. The Plan of St. Gall is a 122cm x 77.5cm manuscript that was discovered in 1844 when a pamphlet containing a 12th century life of St. Martin was unfolded. It shows the layout of 40 structures and spaces for gardens and orchards and a road. 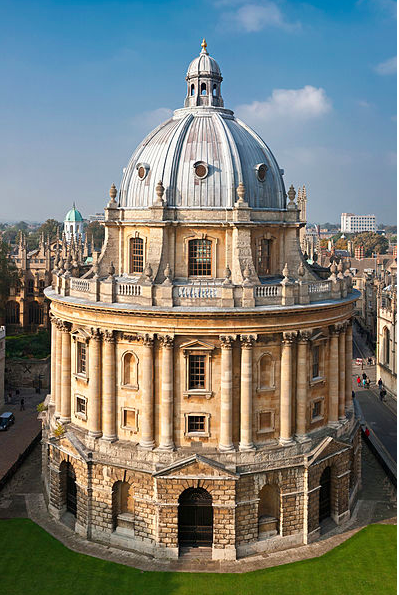 It includes 333 labels that identify the buildings and their purpose. To be clear: the Plan of St. Gall isn't the actual layout of the monastery at St. Gall; the terrain wouldn't allow it. An inscription on the Plan tells us that it was a gift to the Abbot of St. Gall, Gozbertus (fl.816-837), who was responsible for having the monastery's church built in the 830s. According to the men* who brought the Plan to modern attention, it was based on a design made at two Carolingian reform synods held in 816 and 817 in Aachen intended to formalize Benedictine culture. For modern scholars, its value is as a focal point for study about Carolingian monastic life and 9th century architecture. The ongoing "St. Gall Project," administered by the Center for Medieval and Renaissance Studies at UCLA, is not only creating the to-scale dimensions and models of the structures, it is also re-creating digitally the libraries of the monasteries at St. Gall and Reichenau (mentioned here). Despite the idealized nature of the design, it does have a carefully laid out scale based on multiples (and halves) of the number 40. Clearly there was careful thought put into the design. By constructing the "ideal" Benedictine monastery based on the St. Gall manuscript, and re-creating the monastic complex including the written works that would have informed its inhabitants, the project hopes to gain grater insight to the culture and mindset of the early 9th century. *Medievalist Walter Horn and architect Ernest Born produced a three-volume analysis of the document in 1979, The Plan of St. Gall (Berkeley, Calif., University of California Press). The name "Hedwig" is now familiar to millions as the name of Harry Potter's owl, but it has a long history that predates its use by Rowling. Hedwig is from Old High German Haduwig (hadu=battle + wig=fight), and would have been pronounced het-vich. Hedy (as in Lamarr) is a diminutive form of the name. The best-known Hedwig in history (that is, prior to 1997) was a 12th century saint. Hedwig's reputation was built on her piety and fortitude in supporting established monasteries and founding new ones. These monasteries helped spread the German culture of which Henry was fond. As well as establishing monasteries of Augustinian Canons and Cistercians, Hedwig also brought Dominicans (at Bunzlau and Breslau) and Franciscans (at Goldberg and Krossen) to Silesia. Hediwg did not just spend her husband's money in doing good works. She tended leper women at Neumarkt. Her behavior inspired Henry to establish (at his own expense) the first religious foundation for women in Silesia: a convent of Cistercian nuns at Trebnitz in 1203. The second abbess was said to have been the Blessed Gertrude (c.1200-1268), the sixth child of Hedwig and Henry. Hedwig had seven children that we know of—only one of which, Gertrude, outlived her—after which she convinced her husband that they should take vows of chastity. Henry even took on the tonsure of a monk and let his beard grow out (hence his nickname). Hedwig began to spend much of her later life in prayer at the Abbey at Trebnitz. On Henry's death in 1238, she settled into Trebnitz permanently, wearing the gray of a Cistercian (although she never took monastic vows), and died there 5 years later. The piety and care she showed in life impressed more than her husband. 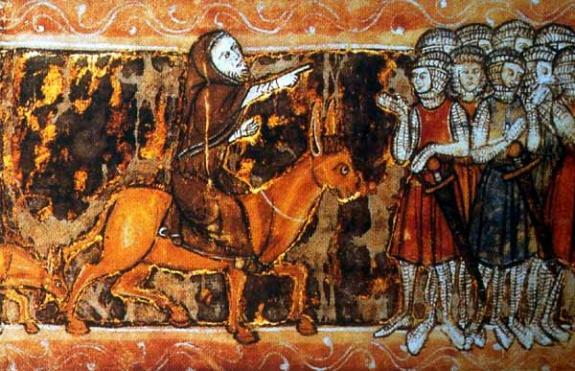 In 1227, Henry was captured by Conrad of Masovia after a military engagement over the possession of Cracow; Conrad hauled him off to captivity. Hedwig immediately traveled to Conrad's location, where her appearance and eloquent pleas for her husband made such an impression that Henry was released. Upon her death, she was buried in the church attached to Trebnitz. Clement IV took time out from asking Roger Bacon to write books to make her a saint on 26 March 1267. *From left to right: (front, kneeling) daughter Sophia, son Conrad the Curly; (back, standing) daughter Gertrude, eldest daughter Agnes, son and heir Henry II the Pious, son Boleslaw; (back, sitting) St. Hedwig, Henry I the Bearded. When Philip IV of France convinced Pope Clement V that his campaign against the corruption of the Templars needed to be extended to all Templars everywhere, Clement issued a papal bull to spread the word. The papal bull had become commonplace by the 13th century. We know they existed as far back as the 6th century, because the lead seal itself exists, even though the message itself does not. We don't have any original bulls from earlier than 819. At that time, they were still being written on fragile papyrus. Once they switched to vellum (calf skin) or parchment aroun the 1th century, the survival rate of documents increased dramatically. Why was it called a "bull"? The term comes from the Latin verb bullire (to bubble). Bulls were a lump of material, wrapped around a ribbon attached to a document and stamped with official seals/markings, indicating their authenticity. They were originally clay, but lead became more common—and, occasionally, gold: Byzantine emperors liked to issue golden bulls. In the case of the popes of Rome, one side of the flat leaden bull would bear the image of Saint Peter and Saint Paul. The "SPASPE" seen in te image above stands for Saint PEter and Saint PAul. The other side would bar the name of the issuing pope. Bulls also have odd names, because they are called after the first few words of the statement, which does not always indicate their content, as I previously explained in the footnote here. Bulls were also not always commands or "new laws." Clearly, the pope had no way to enforce a bull, as when he issued the one about the Templars that was ignored by Edward II of England. Other notable pulls that weren't necessarily embraced: Exsurge Domine (15 June 1520) demanded that Martin Luther retract 41 of his 95 Theses against the Roman Catholic Church, and Sublimis dei (29 May 1537) forbidding the enslavement of indigenous peoples in the Americas. In 1307, on Friday the 13th of October, King Philip of France ordered the head of the Knights of the Temple, Jacques de Molay, arrested along with scores of other Templars. That wasn't the intent outside of France, however. Philip's motive for crushing the Templars was his indebtedness to them, but his opportunity came when Pope Clement V asked the King's help in investigating charges made two years previously by an ex-Templar. Philip used this request as a reason to arrest them and appropriate their property. This is usually considered the "end of the Templars" and the start of their disgrace. Under torture, many Templars confessed to heresy, idolatry, corruption and fraud, homosexuality. With that "evidence," the Pope had to issue a bull on 22 November 1307 demanding the seizing of the Templars and their property all over Europe. In England, however, the Templars found refuge for a time. This was partially due to England being busy with other things. Edward I had died in July 1307, after illness and constant military engagements in order to keep Scotland under control. His successor, Edward II, was a disappointment on many levels, one of which was his lack of interest in administration. Worrying about giving orders for mass arrests was not on his agenda. He focused instead on sport and entertainment, gave up the Scottish campaign, and recalled his banished best friend (with whom he was considered to have an "unnatural" relationship). His hand on the Templar matter was probably forced when he accepted an alliance with France by marrying the daughter of King Philip—a woman in whom he showed no interest. Once the marriage was arranged, Philip started urging Edward to respect the papal bull (and support Philip's personal prejudices) and arrest Templars. 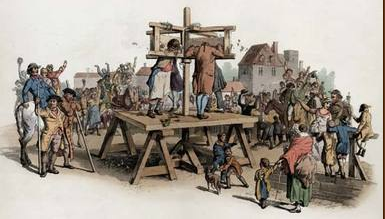 A trial in England was a much more mild approach than the French torture chambers, and the few Templars subpoenaed were made to admit that their order was in error on the subject of the order's master being able to give absolution. The trial lasted until March 1310, by which time the Templars were thoroughly discredited. Rather than arrests or executions for heresy, however, Templars in England generally just transferred to other monastic orders, such as the Order of Hospitallers (which happened to receive much Templar property) and the Cistercians. The Templars in France may have ended with stake-burnings and torture, but in England they simply faded away. King John of England (1166-1216) has so many misfortunes attached to him that it is unlikely he will ever be "rehabilitated" in the eyes of most historians. 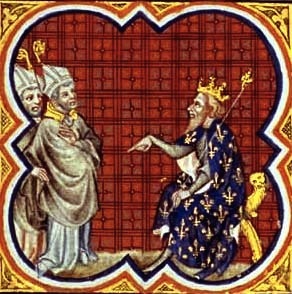 Fighting with his Barons (which led to being forced to sign the Magna Carta—good for England, bad for the King), arguing with Pope Innocent III, which led to his excommunication (meaning he was not allowed to take the Sacraments) from 1209 to 1213, disagreements with King Philip of France (causing the loss, through military misadventure, of his territories in northern France—he had a difficult time getting any respect from his contemporaries. It was a confrontation with French forces that would lead not only to his death, but to perhaps his greatest embarrassment as a king: the loss of the Crown Jewels—not through actions of the enemy, but through lack of caution or proper planing ahead. Some of the Barons, once again fighting with John, invited Prince Louis of France to lead them: he had a slim claim to the throne because of his marriage to a granddaughter of Henry II (John's father). Louis landed with his army at Kent and proceeded to take over parts of the southeast. There was fighting all over. John ended a siege on Windsor Castle and moved toward London to clear out the rebels, then north to end a siege at Lincoln, then to Bishop's Lynn* in Norfolk (see the graphic above). While there, he contracted dysentery; this was in late September. As if that weren't enough, King Alexander II of Scotland (1198-1249) took advantage of the turmoil in England to head south, conquering as he came and intending to swear loyalty to Prince Louis in exchange for holding England. John, still very ill, headed west from Norfolk with his troops, but sent his baggage train across the lowlands of The Wash, the square-shaped estuary marked in yellow in the above graphic. While traversing the causeway and ford during low tide, the slow-moving wagons got caught in the sand, and were overtaken by the cold North Sea waters. The Crown Jewels, and who knows how many other goods and men, were lost in The Wash on 12 October 1216. A week later, John lost his life. He was succeeded by his son, King Henry III, who reigned 56 years until 1272. *Now renamed "King's Lynn" thanks to Henry VIII. Aleppo in Syria ranks with some of the oldest continuously inhabited cities in the world. There is evidence that people lived in that location at least 2000-3000 years before the Common Era. It became known outside of its immediate area when it became one of the western termini for the Silk Road, and goods passed through it on their way from the East to the Mediterranean and Europe. Even before the establishing of the Silk Road, however, it saw prominence as a center of culture. In the 10th century, while it was the capital of and independent emirate, the scholar Al Farabi (briefly mentioned here) and the poet Al Mutanabbi (915-965) briefly created a golden age in Aleppo. It also managed to turn back attacks by European Crusading forces in 1098 and 1124. Aleppo's trouble took place on 10-11 October 1138, when two earthquakes rocked the city, a small one followed by a larger that produced major destruction. Aleppo was home to tens of thousands at this time, but the initial shock on the 10th caused more fear than destruction, and drove many residents to the countryside. The quake of the 11th, however, justified their fears and destroyed much of the city. A contemporary historian, Ibn al-Qalanisi of Damascus, detailed the damage. 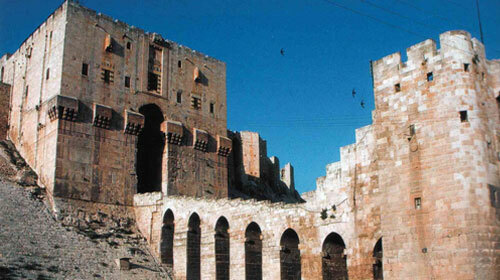 The Aleppo Citadel that had been built by Crusaders (pictured above) partially collapsed, killing a reported 600 guards. A Muslim fort in the town of Atharib, 25 miles from Aleppo, was completely destroyed. Aleppo was too prominent not to be rebuilt, and soon it was a thriving center for commerce and culture again, and being passed back and forth between the hands of different rulers: Saladin, Mamluks, Mongols, and finally Tamerlane in 1400, who killed many non-Mongol citizens and ordered a tower of their skulls to be built as a symbol of his rule. ...and the troubles continue to this day. *An oft-quoted estimate of 230,000 deaths cannot be substantiated, and seems to have been created by a much later writer who was likely conflating the Aleppo quake with one a year earlier in Mesopotamia and/or one a year later in Azerbaijan. Why it happened, and why it happened the way it did, are still hotly contested. Also, there are no images for it that don't themselves require an essay to explain, so this post could make a dull subject even duller. Let's begin. Starting about 1350, pronunciation of English started to change. Not all pronunciation; mostly the long vowels that were stressed in the word. Pronunciation of vowel sounds depends on the relative positioning of the tongue and lips and palate (remember, I am simplifying). To put it another way: how your mouth forms the space in which the sound resonates determines pronunciation of the vowel sound. 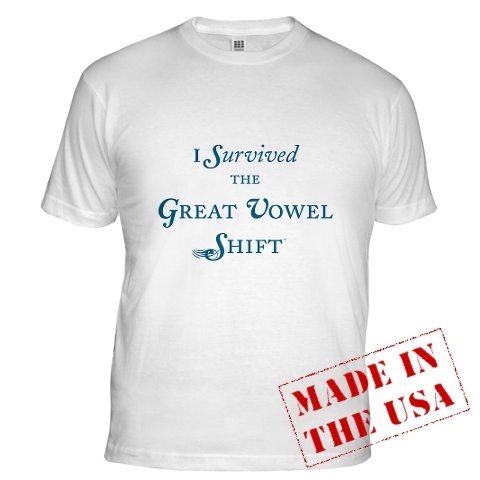 What happened during the Great Vowel Shift is that the pronunciation of those vowels moved upwards and backwards in the speaker's throat. What did this sound like? Without teaching you the International Phonetic Alphabet*, we will try a few examples. The Modern English name would have been pronounced by Chaucer to sound like "na-ma" and by Shakespeare as "neem"; Modern English root would have been "ro-ta" to Chaucer and "rowt" to Shakespeare. There were exceptions. For instance, "ea" took a different path, depending on the consonants around it. It was long, but it shortened when followed by consonants such as "d" and "th"; so we have "ea" sound like short "e" when "ea" shows up in Modern English dead, head, breath and wealth instead (<—there it is again) of sounding "longer" as in great and break. Consonants stayed the same, although "silent letters" did develop later. Chaucer would have pronounced "knife" something like "ka-nife"; that is, both consonants would have been pronounced; it was later that we got lazy and stopped bothering with the "k" in "knife" and "knowledge." So why did it happen? The most common theory is that social mobility after the Black Death brought people from all over England together in the London area where changes were caused by people organically blending the many dialects. There may also have been an attempt to distance England culturally from France. 1359-60 saw a major military conflict between the two, and in 1362 the law courts of London decided to switch from French to English. The original pronunciation of the long vowels was very "continental." The GVS took pronunciation further away from that similarity with the continent (remember that much of the English vocabulary at this time had come in with the Norman Invasion). The sad part is that England had become a literate culture before the GVS was done. Printing was standardizing spelling even as pronunciation was going through its evolution. Therefore, the pronunciation of words moved well beyond their original spelling, creating issues for schoolchildren and non-native speakers for centuries to come. *Which, to be honest, would require me to learn it first. Robert Grosseteste (c.1170-1253) has been mentioned in several posts. His early life, beyond having been born into humble beginnings in Stowe, is unknown. One of our first notes about him is by Gerald of Wales (mentioned here), who recommended him in 1192 for a position in the household of the bishop of Hereford, William de Vere, because of Grosseteste's ability in liberal arts, canon law, and some medicine. He remained in de Vere's household until de Vere's death in 1198, after which Grosseteste drops out of the historical record almost completely. We are sure he is the Robert Grosseteste who was appointed to the diocese of Lincoln in 1225 and concurrently as archdeacon of Leicester in 1229. The double-duties apparently made him ill within a few years, and he pared down to the position of canon in Lincoln Cathedral, and started lecturing in theology at Oxford on the side. According to Thomas of Eccleston, Franciscan chronicler for the years 1224-1258, Grosseteste joined the Franciscan school at Oxford around 1230. Association with Oxford and reduced ecclesiastical responsibilities allowed him time for scientific theorizing and writing. For all his scientific interest, however, his first intellectual love was theology and the direction of the church. He clashed with the papacy several times, leading later scholars to try to label him an early Protestant. But correction is not insurrection (even though his influence can be seen in the writings of a true proto-Protestant, John Wycliffe). Now he is considered a valuable insight into the theology of his time, not a rebel. There are 120 works attributed with confidence to him. They have not all been translated and examined yet. Focus has been on his theological and philosophical works, but many writings still exist only in manuscript form. His still-unedited scientific works may reinforce the current belief that he proves that pre-Renaissance scientific progress was further advanced than previously thought. He died on 8 October, 1253, and was buried in a memorial chapel in Lincoln Cathedral. Postscript: If you are curious in his Latin texts, seek here. One of the greatest historical puzzles is the disappearance of the Ten Lost Tribes of Israel. After the death of King Solomon, the northern kingdom of Israel broke away from the kingdom of Judah, ruled over by the House of David. The destruction of the kingdom by the Assyrians in about 720 BCE supposedly sent the tribes of Reuben, Simon, Dan, Naphtali, Gad, Asher, Issachar, Zebulun, Ephraim, and half the tribe of Manasseh to other locations, where presumably they were assimilated into the native populations. Suggesting that they merely dissolved into indigenous groups is not satisfying to anyone, however. A combination of rabbinical writings and sheer speculation, however, has attempted to answer this unanswerable question. Is it possible, however, that a partial answer was provided by a 12th century traveler from Spain, a sort of Jewish Marco Polo who went seeking settlements of Jews all over the known world and recording details about their lifestyle? Benjamin of Tudela (1130-1173) was born in the little town of Tudela, in Navarre in northern Spain. That sums up what we know of his early life. 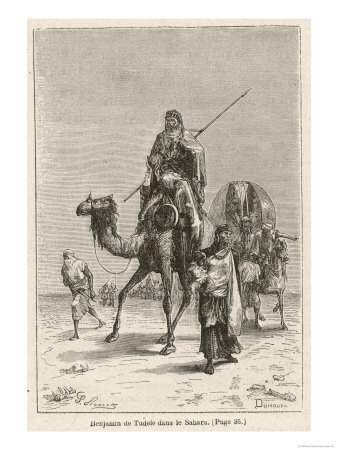 Around 1165 he undertook a journey east—whether his purpose was to visit the Holy Land, to truly map out Jewish settlements, or to make business connections, we don't know—and spent the next 8 years traveling and writing down the details of his travel and of the communities he met. As a 12th century snapshot of life in the Middle Ages—particularly Jewish life across Europe and the Middle East—his Masa'ot Binyamin (Travels of Benjamin) is invaluable to historians, especially Jewish historians, despite its occasional inaccuracies. There are men of Israel in the land of Persia who say that in the mountains dwell four of the tribes of Israel, namely, the tribe of Dan, the tribe of Zevulun, the tribe of Asher, and the tribe of Naphtali. "They are governed by their own prince, Joseph the Levite. Among them are learned scholars. They sow and reap and go forth to war as far as the land of Cush, by way of the desert. They are in league with the Kofar-al-Turak, pagan tribesmen who worship the wind and live in the wilderness. These tribesmen are of the tribes Reuven and Gad, and the half-tribe of Menasseh. Their seat of government is a great city surrounded by the mountains of the North. The Jews of Kheibar have built many large fortified cities. The yoke of the gentiles is not upon them. They go forth to pillage and to capture booty in conjunction with the Arabs their neighbors. If you are interested in more, you can read a translation of his work at Project Gutenberg. The William mentioned was the only surviving heir of King Henry I of England. King Henry and his sons were in Normandy, and returning to England. The ship was offered to him for the voyage, but as he had already made arrangements and was ready to depart, he gave the honor of the White Ship to his sons. Henry left for England. The sons, on their own and in command of a fancy ship, were generous in allowing the crew and passengers to start drinking while dockside. Later, with night approaching and alcohol flowing, they decided (foolishly) to set off and beat the king to England; they were sure the ship could do it, despite being weighed down by about 300 bodies. So they set off into the darkness, with a tipsy crew. The ship hit a rock, tearing a hole in the side. William of Malmesbury's version has one survivor, clinging to the rock all night; Orderic Vitalis says there were two. In either case, we have some details that might be true, such as Prince William escaping in a boat, but going back to rescue his half-sister and having his boat capsized when too many people tried to climb aboard. Prince William's death forced Henry to name his daughter Matilda his heir. When Henry himself died in 1135, his nephew, Stephen of Blois, decided a firm male ruler for England was more important than honoring the oaths he made to support Matilda. Stephen crossed the Channel to claim the throne, and set off almost two decades of civil war.